Home > Blog > FUTURE OF PARKING & ROBOT VALET SERVICE. Technology has now become an essential part of our daily routines. We cannot spend our single day without the help of it. New, advanced and cheap technologies are being introduced for man’s facilitation. Robots have replaced human being in many fields, now. Recently robots have been used for bringing a revolutionary change in parking as robot valet service has been launched in Germany’s Dusseldorf airports to assist the travelers for parking their vehicles. The World’s first robot valet service works through a Smartphone app. Commuters just need to book the automatic system through this Smartphone app before leaving their car at drop off zone from where it would be picked up. It was reported that the robotic valet use laser scanners for calculating the dimensions of car. After these calculations, robot called “Ray”, allocates a suitable place for your car, in reserved parking lot. “Ray” can lift upto 3.3 tones and can optimize the space for parking. This will help to park between 40 to 60% more cars using the same area, which will help to overcome the issues of parking at airports especially in big cities. 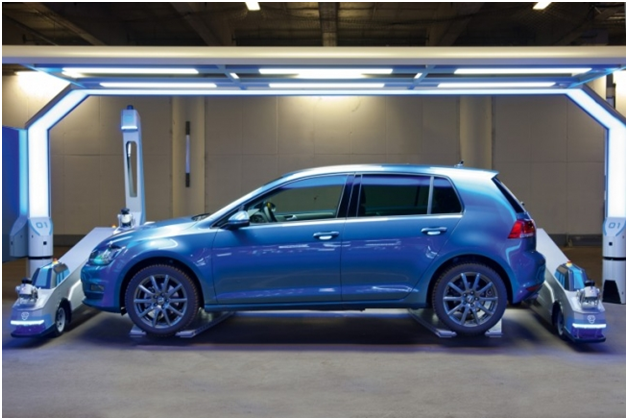 This technologically advanced valet costs 29 Euros per day or 4 Euros an hour. Though the Robot Valet was introduced in Germany, but keeping its benefits in mind it would be better to introduce it in other countries, as soon as possible. Such technological advancement in parking services would not only help the customers but also help the airport parking authorities to improve their services with minimum chance of error along with the low cost and less manpower. Until the introduction of this modern machinery in UK, commuters are free to go for easy and traditional Compare Car Parking UK. Previous PostMisconceptions about Airport Parking & its Solutions.Next PostYES! WE ARE IN GOLDEN ERA OF AIRCRAFT SAFETY. Hello there, I discovered your site via Google whilst looking for a comparable subject, your website came up, it appears great. I have bookmarked it in my google bookmarks. Lots of folks will be benefited out of your writing. Cheers!